One of the best loved areas at the Show is the baking section. There are classes for adults and primary and post primary pupils. With almost €2,500 prize money to be won the number of entries has been increasing during the past couple of years. 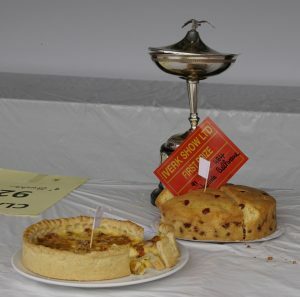 Pride of place must go to the now famous Iverk ‘Great Cherry Cake’ competition. Sponsored by Iverk Produce it carries a first prize of €200 with cash prizes going down as far as tenth place. No wonder there are up to 90 entries annually – what a difficult task for the judges. As well as the cherry cake there are classes for sponge, cup, queen, madeira, boiled fruit and biscuit cakes, white soda and wholemeal bread. The savoury section has classes for quiche, shortbread biscuits or an unusual bread of your choice. How about entering a pot of jam? The fruit was good this year so no excuses. For those of you still in school you also have a choice. There are classes for gingerbread men, rice krispie buns, muffins, plain scones, apple tarts, chocolate brownies of raisin cookies. The good news is that the recipes for a number of classes are given in the prize schedule by Odlums, Goodalls and Shamrock. You can enter on line. Go to our website www.iverkshow.ie for all the details. If you enter on time you will be included in our special draw for €100. A word of warning. Due to the large number of entries and the lack of available space NO late entries or entries on the day will be accepted this year. Get them in on time.